They say there are two types of people: those that love big dogs and those that love little dogs. Okay, that’s probably an over-simplification. Most of us love all dogs, but most of us have a preference when it comes to size. For those of us that have a penchant for the bigger breeds, you’ve heard and seen it all before. Here are 10 things you can definitely relate to. They start small, but they grow fast. Fast is an understatement. 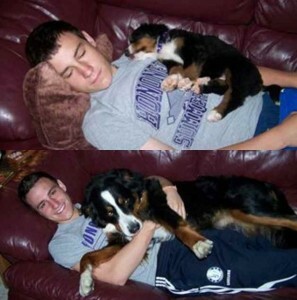 All dogs begin as puppies, but big dogs don’t stay little forever. They may be soft, squishy little pups in the beginning, but they grow to be massive. One night you’ll have a little guy tucked between your legs, the next morning you’ll wake up with a dog taking up half the bed. How did that happen? Big dogs like loads of food (we’ll get to that later…) and they grow quickly. Just by nature of their size, big dog breeds tend to stand taller. So their tales are at the perfect height to “clear the table” of anything not nailed down. One minute you’re enjoying a glass of wine. The next – Gus has bound through wagging his tail and knocking your glass clear off the table. This is why I like dark carpet. It hides the stains better. The neverending reference to dogs in pop culture. Cue the Marmaduke comparisons. The cartoon strip was first published in 1954 and the movie debuted in 2010, and it’s what’s most people think of when they see a big dog. Your dog might not be a Great Dane, but if it’s a large breed, you’ve probably heard someone calling on the classic comic or even the Clifford book series. Take it as a compliment. 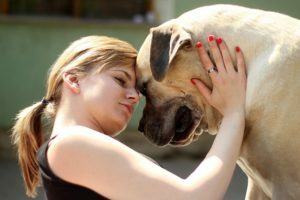 Big dogs = Big love! They need constant exercise. Or do they? This isn’t always true. The larger size doesn’t necessarily equate to longer walks. The dogs that need the most exercise are the dogs with the most energy – some may call them hyper. Not all big dogs need hours of play and fetch. In fact, some big breeds, like Great Danes, were bred to be watchdogs, sitting outside an estate, waiting for an intruder. They’re comfortable sitting by the window and monitoring outside activity. 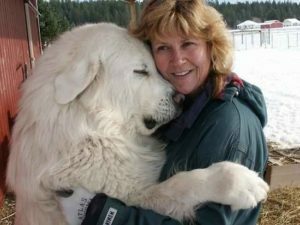 I’d love to hug this big dog too! Big pups know how to snuggle with the best of them. That’s one of the best things about owning a big breed. They make excellent cuddlers. These big boys and girls aren’t necessarily aware that they may weigh more than you do, so they take a seat right on your lap. What’s better than having a big body keeping you warm during the winter months? Nothing! Monthly food bills aren’t on the little side. No way around this one. By virtue of size alone, bigger pups eat more than their smaller counterparts. That means larger portions of kibble and chews. They go through treats faster and a 25-pound bag of food won’t last nearly as long as it would for a Yorkie. But it’s worth the extra cash when you get that slobbering grin. 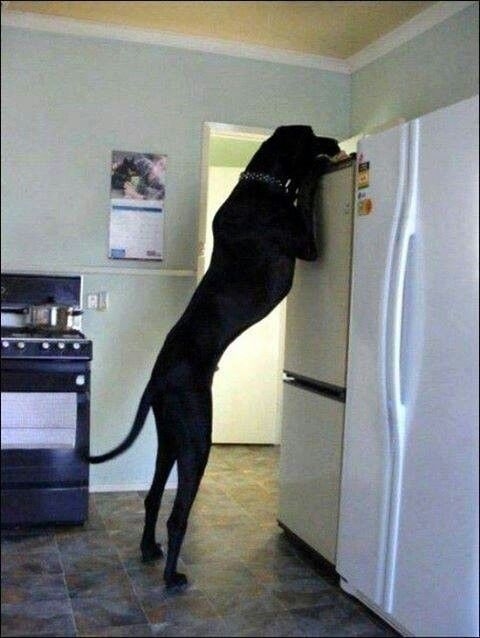 Considering a big dog? 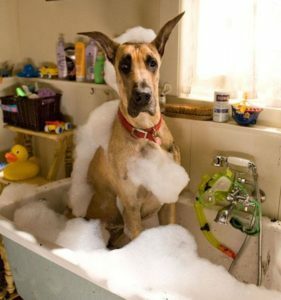 Here are 10 things you should think about before bringing Marmaduke home. Big dogs make big moves in the bathroom. Facts are facts. Big dogs have big bowel movements. More food goes in, so more must come out. Nothing dainty about it. You might even need two bags for the clean up. Maybe a shovel? It’s just the cost of doing business. Sometimes they’re the ones taking you for a walk. Yes, a Mastiff can weigh up to 230 pounds, but that doesn’t mean he’s in charge when you’re cruising down the sidewalk. Nevertheless, the bigger breeds may tug at the leash when they see a squirrel scamper down the way. But as you know, a big dog is just as easily trained as a small one. 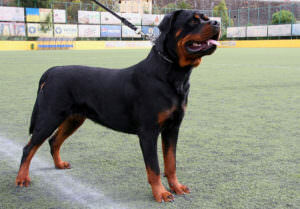 With patience and repetition, big breeds can be taught to walk properly on a leash. If not, be ready to hold on and enjoy the ride. The usual question: is your dog friendly? Bigger breeds can be intimidating. But if you’ve got one at home, you know that these bigger pups are gentle giants. They snuggle with little babies and give sloppy kisses just as much as a Bichon Frise. It’s part of their charm. You can trust them with your small children because these dogs can be very accepting of the little ones’ curiosity. Of course, kids must learn to treat their beloved pups with respect, but bigger dogs are known to have a great deal patience. The kitchen is no longer a safe space. You’ve probably made this mistake once or twice and forgotten that your long-legged friend can easily reach the kitchen table or countertop. That makes it pretty easy for your pup to swipe a chicken leg or a piece of cheese pizza. All’s fair in love and turkey – but remember to keep grapes and chocolate out of their reach. Toys don’t have a long shelf life. One tennis ball just won’t fly with the big breeds. You need to stock up on sturdy rope toys that won’t unravel with a few tugs from your dog’s chompers. You’re constantly replacing toys because extra large teeth and powerful jaws are quick to destroy them. No small Kong toy for your precious pup, check out these extreme chew toys for your big bruiser. The next time someone comments on the size of your best friend, remember that big dogs are boss. They may be large, but that’s more fur and body weight for you to love. The post 10 Things Only Big Dog Lovers Understand appeared first on iHeartDogs.com.